Dimensions 22.0 In. X 19.0 In. X 13.0 In. Stay away from this bench. It's not stable. The nonslip levelers screwed into the bottom feet are 1/4 inch high so this elevates the bench off the floor. The bench does not lie flat on the floor. This makes the bench wobbly. Nothing better than having a spa bench in your shower, for all of the product in the shower the second level shelf is perfect the seat is comfortable the height is perfect for any shaving needs. Purchased to use directly in our guest walk-in shower to provide additional storage for shampoos and soap as well as a seating area. It's a bit smaller than expected but is very good quality and it does appear sturdy and well made. Very nice bench. It comes completely assembled which is a great advantage. It looks strong and, even though it is a solid product, it looks very delicate as well. It is a little lower than expected but it certainly works for my needs. I recommend it!!! It’s the perfect size for my shower. The quality is great, very sturdy. Looks great. Would recommend for anyone looking for some seating in your shower! 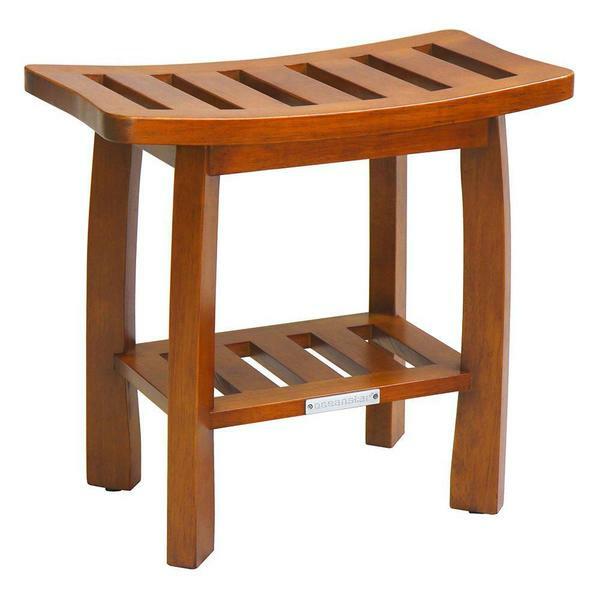 A lovely little shower bench, sturdy and also comes in one piece. No assembly required! I have this huge shower and put it on the end and looks great there. A solid wood bench that I know will hold me if I sit on it to shave my legs. This bench will probably outlast me! We chose this design because an earlier stool we purchased was not available. Beautiful finish, design is perfect, very sturdy, just as we anticipated. It has held up very well in shower. Good height, my husband is 5'11" Would purchase again. Just as pictured. so far, sturdy and attractive. Damaged-returning. but I like the style. The stool was made well except for one cap on one leg missing. They did send me a matching set of four leg caps pretty quickly. Does seem to be well made. The finish is nice. A little early for me to know how well it will last in the shower but overall it’s what I was looking for. I am disabled. Hoping this helps. The maximum weight limit for this bench is approximately 300 pounds.